Participants of CicLAvia will be riding down Wilshire Blvd. Sun., June 23 passing area landmarks and rest-stop “hubs” along the way. 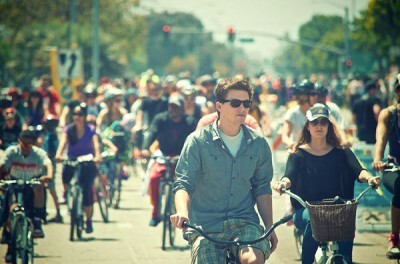 If a recent CicLAvia event with some 180,000 participants is any guide, many, many cyclists are expected to participate. The pedestrian-, skate- and bike-friendly route will run along Wilshire from downtown at Pershing Square to Fairfax Ave., from 9 a.m. to 4 p.m. Hubs—pedestrian-only zones featuring food trucks and rest stops—will be at Fairfax, Rimpau Blvd., MacArthur Park, Western Ave. and at the starting point, One Wilshire. Automobiles will lose their right of the road, and, there is no street parking on the route from 1 a.m. to 5 p.m. Cars can cross the route at designated spots, such as at Vermont, Western and La Brea avenues. A podcast by architectural researcher and commentator Edward Lifson and an architectural walking guide by Catherine Gudis will be available. The event is part of Pacific Standard Time Presents: Modern Architecture in L.A., sponsored by the Getty Foundation.